bota, ox skin used as a wineskin, bota, bota bag. 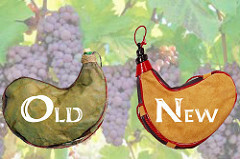 ordre, wineskin, water bag or oil bag. This consists of cured animal skins, sewn together except for the neck, which served as an opening. In the Arcipreste de Hita´s Libro de Buen Amor, Song of the Highlander, Juan Ruíz discusses customs of period concerning bovine livestock. He states that making wineskins was common. zaque, goatskin made into a sack to hold wine inexistent today. Cervantes relates that although Quijote drank wine from a horn, like an emperor, Sancho Panza passed around a bota bag for all to sip. He drank so much it made him sleepy. See azacán. 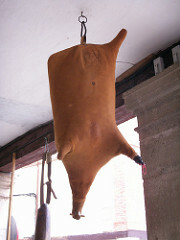 ordre con el sebo o de manteca, wineskin containing suet or lard. This was an annual tribute paid by butchers during the 11th C in León.